Check out Page Turner Winner Leola Ogle’s interview here! 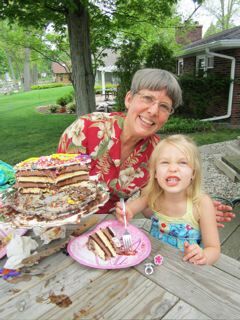 And now it’s time to let you get to know Beth Muehlhausen, one of two runners-up in the 2012 Page Turner contest. 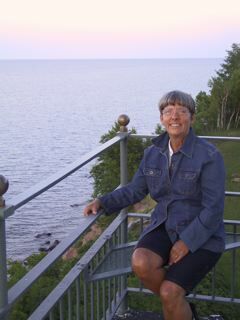 Read on to learn more about this long-time FWer (and fellow Michigander), her book in progress, and her long-time passion for words. JOANNE: First of all, congratulations! When do you first remember developing a passion/love for writing? BETH: In elementary school I was enthralled with words – magical symbols representing mysterious, faraway places as well as the voice of my own wee heart. In Miss Perkins’ class in third grade, I asked for extra sheets of wide-ruled paper to take home (those with straight blue lines to guide upper case letters and red dotted lines in the middle to guide lower case). I sat at our kitchen table and carefully cut those papers into smaller rectangles, then meticulously copied short rhymes or fables onto them with a pencil. These pages were then compiled and stapled together to form my own “books.” Later editions of “books” held my own writing – I think I still have one (somewhere) about a bear family! Between the ages of eight and twelve I was often lonely, and fell in love with reading – an activity that expanded and enhanced my solitary world. One summer I devoured the Bobbsey Twins series, and read and read until my stars on the library’s summer reading chart walked all the way across the poster and around to the other side! I was the only child with stars on the back of the poster, and yet in my mind, the recognition was secondary to the magic. Who wrote these stories, anyway? What did it take to become an author? In high school, a couple of teachers encouraged my writing and love of words, but my sagging self-confidence didn’t match my writing dream. In college I majored in English, but found the required reading of literary classics overwhelming and sometimes tedious. I was more interested in writing, and relished the one and only creative writing class offered in the curriculum. The teacher for that class pushed me beyond my own innate ability, and I longed for more of that kind of challenge. After college, my passion for words and writing took a back seat for decades while life’s more urgent demands took over. I didn’t give myself permission to write for a very long time, with the exception of a few isolated journal entries. Finally in 2005, at the age of 56, the old passion rose to the surface again, still intact and begging for release. JOANNE: And it HAS been released – with gusto! Is writing a hobby or potential career for you? BETH: Writing is my therapy. It gives expression to an inner voice that refuses to be quieted. I lose myself in writing – lose track of time, place, and even a long-standing physical disability that otherwise threatens my sanity. As I continue my writing journey as a senior, I simultaneously wait on God to see where He leads. My focus is on representing and giving glory to Him through my writing, and leaving the “hobby” or “career” question in His hands. JOANNE: I can definitely relate to the therapy thing 🙂 Share a bit about Just One Person. Where did you get the idea for it? What’s it about? How far along in it are you? My sister Ann passed away in 2005, leaving behind copious written memoirs explaining her challenging journey through life. For years she wanted to write a book to help others, particularly children and their families who struggled similarly. After her death, a posthumous diagnosis revealed Ann had wrestled with unidentified Asperger’s Syndrome – and suddenly the mismatched puzzle pieces began to come together. Two separate professional autism specialists confirmed the Asperger’s diagnosis, and encouraged me to write Ann’s book for her – something I’d already promised her during a poignant moment in her final days. I have been wrestling with her materials ever since, juggling periods of intense writing activity and stark dormancy (burnout). I feel this project has been divinely placed in my lap with a message that needs to be shared: It takes just one person to believe in a marginalized individual; just one person to support his or her quest for fulfillment. Ann knew one such person, a high school guidance counselor named Phyllis Garrison, who exemplified divine love and risked coming alongside Ann as an advocate when everyone else held her at arm’s length. My own personal memories serve to support my writing goal. I feel not only relationally able, but also linguistically prepared (thanks to FaithWriters), and personally selected and inspired by our Lord. It is not an easy book to compose. It is one I must write. At this point, a skeleton of a manuscript exists. The huge, ongoing challenge consists in sorting and collating Ann’s disorganized writings (which ramble on and on, but are also expressive and beautifully articulate) and putting them together in a way that encourages the reader to become just one person. I hope to use my voice in the first section of the book while quoting Ann to provide authenticity, but allow her own voice to predominate in the second. There will be either a third section or appendix with pointers for readers who are inspired to become advocates: just one person. JOANNE: Wow – what an undertaking! I’m fascinated 🙂 You’ve entered the Writing Challenge over 250 times. (WOW! )What do you like most about it? BETH: I began entering the Challenge because of a prayer (more about that in my next answer), and continued entering as an act of obedience to Him for answering that prayer. I was committed to enter every week come rain or shine, illnesses or holidays or kids’ weddings, and did so for almost seven years. As an aside, in case anyone checks, I asked Deb to delete an earlier entry as a personal favor – so one is missing. The Challenge presented me the opportunity to invite my old passion for writing out of a locked and almost-forgotten closet. It had been a very long time since I’d written anything, and yet because of FaithWriters, all of a sudden I was DOING IT. I loved the idea of a weekly “assignment” or goal, and the quick turn-around. No time to waste. Get on it, get writing, get done, get it turned in…and do it again…and again. I found writing to topics of interest very fun and energizing, but writing to topics of disinterest also stimulating rather than daunting (I remember the quarter when we wrote about different continents – whew!). Of course it was always edifying to hear what others had to say about my Challenge entries. Fellow Challengeers’ critiques and the judges’ placements (although both are subjective to some degree) were consistently encouraging and motivating. But what do I like most about the Challenge, you ask? The fact that I write WITH a community of people who share two common passions: faith in Jesus Christ and composition. Writing is generally a lonely pursuit, and the FaithWriters Challenge brings the pen out into the light of day – but in an atmosphere of Christian love, compassion, encouragement, and hope. It also provides mega-opportunity without any pressure. I like that. JOANNE: The challenge really is all that! So, how did you find FaithWriters and what made you stick around? BETH: In June of 2005, I was alone at our lake house (which is now our permanent home), sitting at the kitchen table late at night, maybe 11:00. The house was dark except for my computer screen, although the moon hung low in the sky with its reflective path leading directly across the water to our house. It seemed that heavenly eyeball spotted me, and called me forth on a trail of faith. My wailing went on for a while. I was convinced it WAS too late. I’d given up writing for other more pressing passions: a spouse and four children, life in the country, business ownership. Surely my old passion for writing could not be recovered – or could it? Eventually I wiped the tears enough to type “Christian writer” into Google. I’d ask God for an answer, right here and now. In a split second, up popped FaithWriters, the first link on the page. I clicked, discovered the Challenge almost immediately, and submitted an entry that same night. I couldn’t wait for the next week’s topic to be announced, and was shocked several days later to find my entry placed. Evidently God was saying it was not too late, but rather just the beginning! Why did I stick around, you ask? I couldn’t leave, but was compelled to stay: to keep writing. I met people – exceptional Christians, encouraging co-writers. It was home. The more I wrote, the more the inner stirring continued and the more I had to write. Each year as the first week in June passed, I clicked off another year of weekly writing at FaithWriters – first one anniversary, then two, three, four, five, six years….and I began to wonder if I would write to the perfect number of years, seven? As seven drew near in 2012, I knew my sojourn with the Challenge was indeed about to be interrupted. I’d been prepared for something else, something beyond the Challenge. At seven years I would stop and refocus on Ann’s book. JOANNE: That was quite a run there! Hoping once you get Ann’s book done, you’ll be back 🙂 Tell us about your family. BETH: In 1949, I was born a Johnny-come-lately to parents in their 40’s who had daughters ages 11 and 13. Although I received good care, my parents struggled with runaway depression and anger during the years of my childhood. As a result I cultivated haunting, if false, beliefs that I was unwanted and did not deserve to realize my dreams. I met a young man from the lake, sailed (literally!) through several seasons of glittery summer romance, and married him a week after my 22nd birthday. We had four children who are now 39, 36, 34, and 30 years old. The generational wheels keep turning, and we’ve been blessed with nine grandchildren, four boys and five girls. One of the boys is a special needs child with a chromosomal deletion causing him to be severely retarded – and also enabling him to teach us the depths of sacrificial love. My husband has been a college professor for 32 of our 41 years together, and is retiring this month with an impressive collection of teaching awards to remind him of his success in the classroom. We are blessed to have a faithful family. All of our children are devout followers of Jesus Christ, although their affiliations and walks differ greatly. Rather than being divisive, I find this a wonderful blessing that challenges me to grow beyond limitations I might not even recognize otherwise. Our common earthly family identity continues to be the Michigan lakefront, where we prioritize time together every year around the 4th of July, and whenever else possible. We start the kids on the flexaboard (like skis only connected at the tip) when they’re two years old, pulling them between piers in the shallow water. We’re all “lakies” and love the mystery, beauty, and recreational possibilities of water. JOANNE: What are your other passions besides writing? 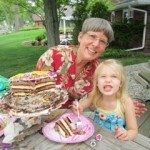 BETH: I love to cook creatively, and owned/managed a custom bakeshop, lunchroom, and deli in my 40’s. We did almost all of our work there from scratch. I continue to experiment within various food prep parameters – for example, a juice feast (a fast during which one gorges only on freshly extracted vegetable and fruit juices), an all-raw diet (so good for us, sort of like walking back to the table in the Garden of Eden), a gluten-free, sugar-free, dairy-free diet; an anti-inflammatory diet. The goal is always to be as healthy as possible – to honor God with food choices, and steward our bodies for Him. I love to walk, and try to get in a 2-mile stint almost daily. I love to wonder. Mystery is my favorite word. I love to swim. Last summer I swam the lake, north to south, without stopping (1 ¼ miles). I love to hope. I’m convinced hope is both a gift and a discipline. BETH: I no longer make New Year’s Resolutions because of my human weaknesses in carrying them out. However, I do have goals, and hopefully, with God’s help, some (or many) will be realized in the coming year. 1. I hope to finish Ann’s book and see it published. 2. I hope to expand efforts in women’s ministry at my church. 3. I hope to confront a chronic (personal) health issue from another (alternative) point of view and support my husband in his own health pursuits. 4. I hope to embrace each moment as a kairos moment. 5. I hope to rely more and more on God’s mercy. JOANNE: Those are certainly worthwhile goals – especially, may I say, that last one 🙂 It was so nice to get to know you, Beth. Congratulations again, and I’m sure that this book will be an inspiration to many. Be sure to watch the blog in the coming weeks for an interview with Dannie Hawley, the other Page Turner runner up for 2012! Meet 2013 Page Turner Runner Up Jim McWhinnie! 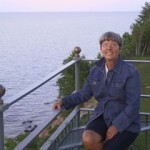 I enjoyed reading more about Beth…appreciated the “non-resolutions”…always enjoy her blog posts. I enjoyed getting to know more about Beth. What a wonderful lady! Very inspiring, and as a mom of one who has Asperger’s, her book premise moved me to tears. Just having one person believe in my son and his ability to move forward is a strong hope of mine, too. We, is parents, believe in him, but it would be a wonderful gift for him to have a person like that in his life. Great interview! Beth-this brought tears to my eyes and touched me on so many levels. I empathize with your writing journey, especially since we’re about the same age. Mostly I was touched by your sister’s story. I have a handsome, delightful grandson who struggles with Asperger’s, and I would definitely buy your book about your sister. God bless you, dear lady!